Premier Kathleen Wynne's first 6 months in office was characterized by an acceleration in the activities she feigns concern over so well - more wind turbine projects than ever before are being approved and another suburban seat has been bought (this one with a subway - they'd already cancelled the possibility of the wind turbines off the bluffs to protect their Scarborough seats prior to the last election). Meanwhile, the cancelled/relocated gas plant scandals continue. The government response has been to force the energy bureaucracy into a summer of assigned 'conversation' with the small subset of Ontarians deigning to converse with it. The Premier would find more conversational partners, if she cares to find them, by actually doing something to halt an expensive, backroom-born, opaque, emission generating, electricity ratepayer-punishing, decision from the McGuinty era. Brad Duguid (pronounced "do good") was the minister that announced the Samsung deal. Duguid was a central figure in many of the poor decisions that have the current government in constant crisis control mode, but the worst directive of his stint as Minister of Energy may be the direction to extend the NUG's. The 1980's, and early 1990's, were a time in Ontario's Electricity sector history when massive projects, primarily nuclear builds (Pickering B, BruceB and Darlington - in that order) were underway as demand growth unexpectedly slowed (it's been slowing for 6 decades and it's still somehow unexpected). Rate impacts for new projects then, as now, couldn't take effect until the project entered service, so as Darlington was repeatedly delayed, and cost escalated, concern started to build about the costs of electricity in Ontario, but concerns also grew about the power planning process in Ontario. The changeability of the future suggests to us that megaprojects are becoming less of a credible answer. They are a huge capital drain and carry a great deal of financial risk. When the future is uncertain, it's better to count on smaller increments that track growth in electricity demand more precisely, and don't pose such a rate shock when they come into service. Their environmental impacts should be smaller- or at least more localized. That's an important reason why, by the year 2000, we expect non-utility generators will be able to meet 14 per cent of our system load requirements. When Hydro filed our 25-year plan in 1989, we were counting on 1,000 megawatts of non-utility generation. Since then, we've announced new targets. We now expect 3,100 term. Response from the private sector has been overwhelming. We are malting deals with as many proponents as we can fit onto the transmission system. Projects involving cogeneration are getting preference, for environmental and economic reasons. Clearly, cogeneration efficiencies of up to 80 per cent reduce overall energy use and environmental damage. And it's clear to us at Hydro that industries that generate revenues along with energy will be able to compete better against their global competitors. And by avoiding major new investments for Hydro, they will help make our province more competitive. By the time Mr. Eliesen delivered this speech 1989's 25-year plan was already outdated; a deep recession had gutted demand from levels already lower than anticipated when the "megaprojects" of Pickering B, Bruce B, and Darlington were initiated. The inertia of bureaucratic plans was still masking the obvious from Eliesen. During a recession the target was tripled because it was plausible to argue the projects were good for business and "green": cogeneration provided a more efficient use of gas, and some projects used exhaust gases from TransCanada's pipeline to generate power. As Ontario ended the NUG strategy that would make industries "able to compete better against their global competitors," it started to recover and move to a much stronger economy. When Ontario Hydro was broken up, it's liabilities were either deemed backed by assets, or deemed to form an unfunded liability to be managed by the Ontario Electricity Finance Corporation (OEFC). The OEFC's first annual report showed at formation an unfunded liability of $19.433 billion, of which $4.286 billion was due to the expensive NUG contracts. By 2005 the market had been launched, a government had cowered and frozen rates, and the newer Liberal government had, under Minister of Energy Dwight Duncan, introduced the global adjustment mechanism which created a method to recover from ratepayers, on a monthly basis, the full costs of electricity contracts, including the NUG contracts. Effective January 1, 2005, the OEFC started to receive actual contract prices for power sold under legacy Ontario Hydro Power Purchase Agreements (PPAs) with the non-utility generators (NUGs), as well as related administrative costs, and is no longer incurring losses on these contracts, effectively eliminating this liability to the OEFC. When gas-fired resources are used, they are generally planned to be SCGT, to meet peaking requirements, or CCGT, to meet intermediate requirements...There are also a number of gas-fired generators, known as non-utility generators or NUGs, which are assumed to operate as baseload resources because of the contractual terms of their current NUG contracts. The Plan assumes that for the NUG contracts that expire by 2015, the associated capacity will continue, but will meet intermediate and peaking load requirements, depending on whether the NUGs are CCGT or SCGT resources, respectively. 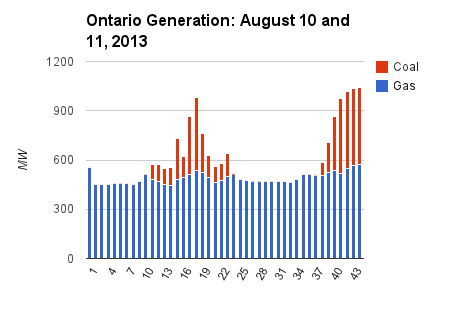 This weekend the Independent Electricity System Operator (IESO) Hourly Generator Output & Capability report showed natural gas-fired generation reduced to ~500MW, which coincides with about 1/2 the NUG's being curtailed for the weekend (because the OEFC holds the contracts, curtailment is scheduled ahead of time and generally for a weekend). It appears Ontario's ratepayers may be charged for the NUG production that was curtailed while Ontario's atmosphere received emissions from the NUG production that wasn't curtailed during off-peak hours, and during on-peak hours we didn't get the emissions from the inflexible NUG's but instead got a full component from coal-fired generation ! NUG's provide inflexible, expensive, greenhouse gas emitting generation. They were originally contracted under a false premise that megaprojects were more expensive than multiple small projects nobody paid much attention to; they provided about 6% of the supply mix as Ontario Hydro was broken up but accounted for ~22% of the unfunded liability Ontario's ratepayers were left to deal with. Some NUG's provide a benefit to the natural gas pipeline business - and it's somewhat obscene that electricity ratepayers are funding the natural gas industry this directly. Ontario claims to be consulting on a Long Term Energy Plan, yet it again deals primarily with electricity. Electricity CO2 equivalent emissions are less than the emissions from fossil fuels providing residential heating. 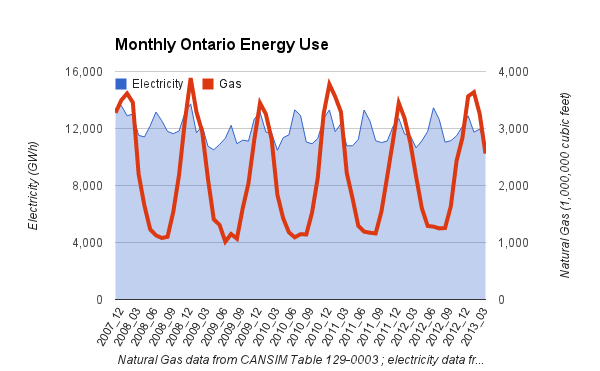 Most Ontarians that opine on energy don't seem to realize our peak use is in winter; electricity peaks in the summer but that peak isn't much different than other months, whereas natural gas use soars in cold weather. There is no justification for spiking electricity rates higher to subsidize gas heating and the operation of gas pipelines, which leaving explanations of extending non-utility generators' contracts ranging from incompetence through consultation processes hopelessly skewed to favour lobbyists/"stakeholders" and at the most unseemly end, corruption. Dealing with the ridiculous NUG directive would provide an indication that the Premier really does want to have a meaningful discussion about the electricity sector; without some meaningful action, her claims to want to have a conversation only indicate a desire to appear to care.